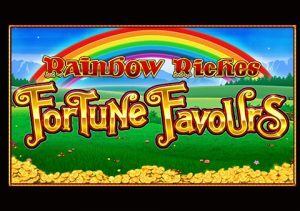 Irish luck is once again the theme on offer in the latest release in the Rainbow Riches series, Rainbow Riches Fortune Favours. It’s a 5 reel, 10 payline game from Barcrest that’s best enjoyed in Big Bet mode which is played on 4 reels sets and offers plenty of extras. Stakes range from between 10p and £500 per spin. Like the rest of the Rainbow Riches video slots, Rainbow Riches Fortune Favours is a simply designed offering. With green fields, blue skies and a rainbow in the background, you’ll see lower value playing cards spinning around the reels alongside mushrooms, harps and rainbows. Comfortably the most lucrative symbol is the Rainbow Riches logo which offers 5, 25 or 250 times your total bet if you land 3, 4 or 5 in combination. You’ll also see the Magic Fairy – when these land, they all morph into the same matching symbol. A new payout is made with the transformed symbols in play. This is the Magic Fairy Wild feature. Many Barcrest games give you the opportunity to play in Big Bet mode. The jump between standard and Big Bet play is very wide here as far as features are concerned. In all cases, these linked spins are played on a new reel set made up of 4 machines. The extras on offer vary depending on which level you play at. £10 Big Bet – the Magic Fairy is live. £20 Big Bet – the Magic Fairy is live and copies onto the same position on all reel sets if it lands on 1. £30 Big Bet – the Magic Fairy is active and copies when it hits. Another wild is also live here. £40 Big Bet – the Magic Fairy and Wild are both in play at this level. When either the Magic Fairy or wild land on 1 reel set, they copy to the same position on all the others. £50 Big Bet – all the extras at the £40 Big Bet level are in play at these stakes. In addition, the lowest value 10, J and Q symbols are removed from the reels on all 4 machines. Playing in Big Bet mode boosts the return to player rate too, rising to 97.7% from the 94% offered at minimum stakes. Playing in Big Bet mode in Rainbow Riches video slots has always offered extra features. The jump here is probably the most extreme. There’s really very little on offer as far as features go if you’re playing at min stakes and you’d be better served looking elsewhere if you’re nursing a small bankroll. Rainbow Riches Fortune Favours lives up to its name. It’s really a video slot for deep pocketed high rollers. If that sounds like you and you enjoy the Irish fortune theme , hen this latest Rainbow Riches offering is worth considering – it should have been called Rainbow Riches Fortune Favours the brave!